Blogs and website typically offer an RSS feed that outputs all of their latest headlines and links to a single page feed reader that followers can subscribe to. Edgar can read these feeds and import content from these sites. On the Import page, you can add feeds with Edgar's RSS integration to be added to your library automatically. Why can't I connect an RSS feed to Instagram? You can add RSS Feeds on the Import page. Enter the URL for the website you'd like to import from. Click the Find RSS Feed button. Edgar will check the website to see if an RSS feed is present. If it is, he'll grab that feed and then let you choose your options for it. Once Edgar finds your feed, he asks you to set up the feed's import options. Select the category where you'd like Edgar to put the links from the feed. Choose whether you'd like the links to be sent directly to your library or to the pending content queue where you'll have a chance to review them before they're published. Choose whether posts imported from this feed should be Use Once. Select the social accounts you'd like to associate with the feed's links. RSS is designed to output only the most recent content. Most feeds will only give Edgar the 10 most recent posts on their site. For WordPress blogs, you can change that number to import more content: WordPress RSS Settings. You can edit your connected RSS Feeds in the 'Manage RSS Feeds' tab in the Import page. Click the drop down menu next to any feed to edit, delete, or manually import the feed. Edgar will check RSS feeds once every 24 hours, usually in overnight hours US ET time. 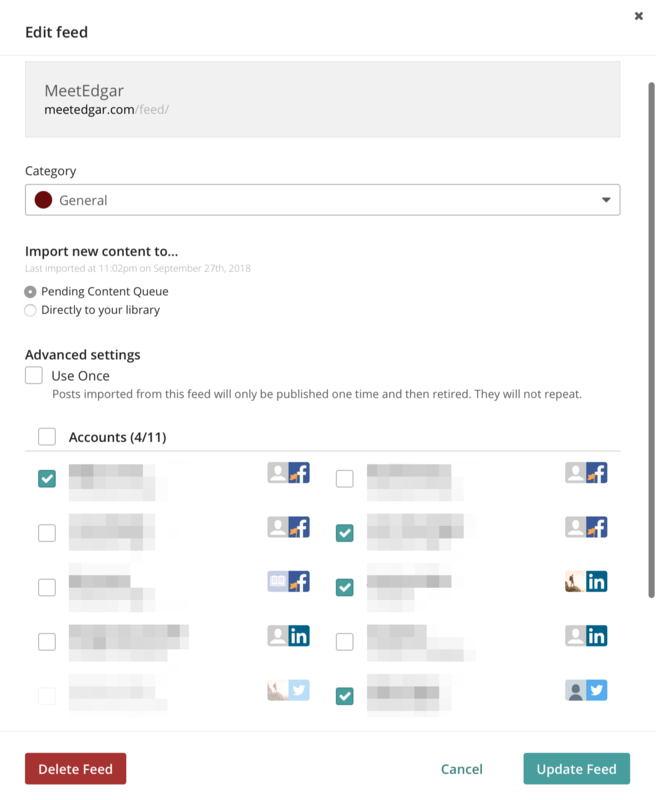 Edgar's RSS feed integration imports the link and title of posts from your feeds. But, Instagram requires that an image or video be attached to every post. So, Edgar can't automatically associate your RSS content with your Instagram account. To send posts imported from RSS to Instagram, edit the post to upload an image or video. Learn more about Edgar & Instagram.